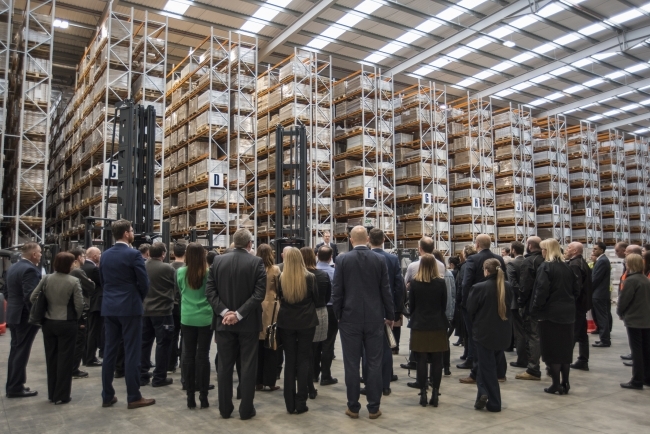 International luxury flooring firm, Amtico, has officially opened its new showpiece building in Coventry, close to its existing factory. Amtico’s CEO and Regional Chairman of the West Midlands CBI, Jonathan Duck, said: “Amtico is a forward thinking company with ambitious growth plans over the next few years. We’re incredibly proud to have our roots in Coventry and play our part in the UK’s export led economy, so securing this site for all of our logistics, warehousing and training is incredibly important. It is sure to have a positive impact on Amtico’s future. The position of Pilot Park is in close proximity to Amtico’s existing factory, allowing the company to retain staff and continue to support the local community. As the largest manufacturer in the area, Amtico currently employs over 400 staff at its head office in the north of Coventry. • Amtico has invested in 24 paid internships in the design team over the past 7 years, as well as 10 apprenticeships across its manufacturing/engineering activities in the same time scale. • Amtico’s Coventry manufacturing facilities produce over double the volume they did 5 years ago, and 4 times as much as 10 years ago. • In 2017, 326,368 cartons were handled individually to be sent for next day delivery in the UK. • Amtico has delivered to Macau, Azerbaijan, India, Singapore, Vietnam and Tahiti. • If every pallet in the Pilot Park warehouse was lined up end to end, they would reach to Amtico’s Solihull facility. • Amtico delivery vans travel the equivalent mileage of driving around the world 39 times a year. • Pilot Park contains 15,400 pallet spaces, 12 doors and 73,000 sq ft of space. • The forklift trucks used on site are all electric instead of diesel or gas. • By moving to the new facility, Amtico has successfully reduced the average ‘product journey’ from 95 miles to 4.5 miles.